U.S. stocks rose for a third straight week, and for the first time since 1999 all four major benchmark indices, including the Russell 2000, simultaneously reached new all-time highs. Strong economic data and the prospects of tax cuts and meaningful fiscal spending after Donald Trump won the November 8th presidential election has fueled equity optimism along with increased speculation on Federal Reserve rate hikes. This in turn sparked a US dollar rally with the greenback strengthening against all but two of the major world currencies this month. Small-caps stocks, as measured by the Russell 2000 Index, have benefited the most, gaining 16.55% over the past 15 consecutive trading sessions, its longest rally since 1996. For the week, the S&P 500 ended the Thanksgiving holiday-shortened week up +1.45%, the Dow Industrials rose +1.51%, and EAFE (developed international) gained +1.29%. JPMorgan’s outlook calls for a sharp pickup in global headline inflation and a more moderate pickup in real economic growth as past shocks from the collapse in commodity (oil) prices and the slide in emerging markets demand growth fades. The business sector could see the biggest improvement as pricing power and corporate profits recover in goods-producing industries, likely driving a pickup in business expenditures (capex). So as the global economy solidifies its bounce-back from the disappointing first half of this year, prior expectations for the world’s major central banks are also reemerging—though with somewhat more modest aspirations. The Fed began the year looking for four hikes and is nearing year-end with only one hike likely. Although much has happened in the three weeks since the Fed last met, incoming U.S. data has generally been favorable. Looking forward, JPMorgan expects the Fed is likely to be sensitive to data, including this Friday’s November payrolls report. Any increase near the 180,000 forecast should nearly cement a December 14th rate hike. However, the roughly 4% jump in the trade-weighted US dollar since the election is raising concerns about downside risks to economic growth and inflation in the first half of next year—similar to the events a year ago that delayed the Fed. This contrast is depicted in the chart above, with Federal Reserve FOMC policymakers again being more aggressive in their year-end key lending rate forecasts (in gray) for the next three years. 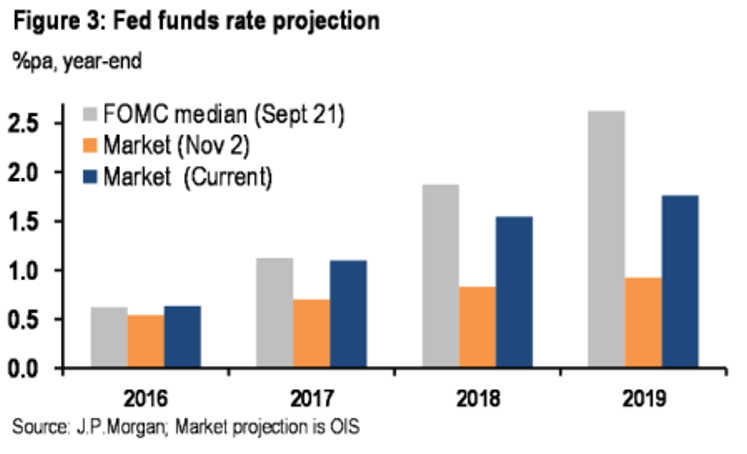 Market-driven forecasts in Fed Funds futures, both before the election and after, are more moderate.